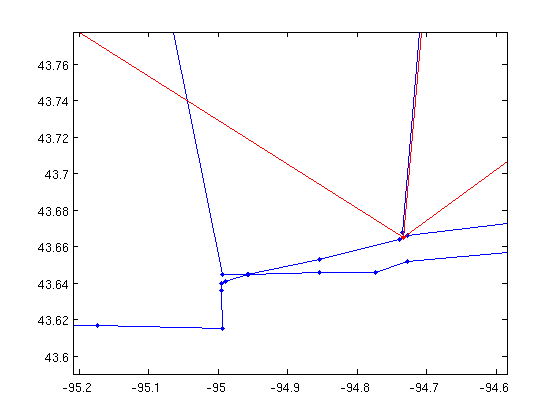 In version 1.35.0, the Boost Graph Library added a large suite of planar graph algorithms. Two functions help test if a graph is planar. The algorithm is the Boyer-Myrvold planarity tester. Of course K_5 isn't a planar graph. To get more information about why it isn't planar, we use the boyer_myrvold_planarity_test function. When a graph isn't planar, this function will isolate a Kuratowski subgraph. A Kuratowski subgraph is a certificate that a graph isn't planar. A Kuratowski subgraph must contract to either K_5 or K_3,3 (a bipartite clique). In this case, the graph was K_5, and so K was the entire graph. Let's have some fun! 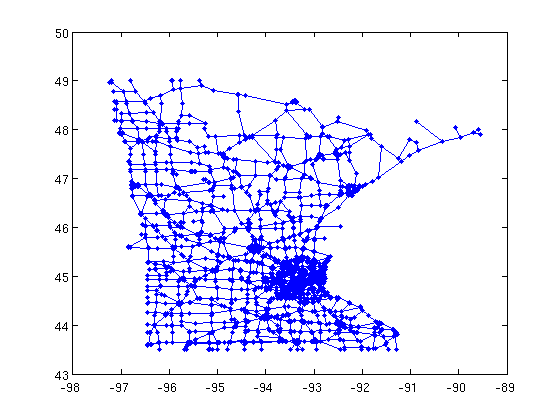 Let's look at a road network. What? The road network isn't planar? Let's see what is going on here. It looks like there are a lot of tree-like portions. Those shouldn't be the problem, let's remove them. We'd better check the graph is still Kuratowski. There's a function called is_kuratowski_graph that does just this task. 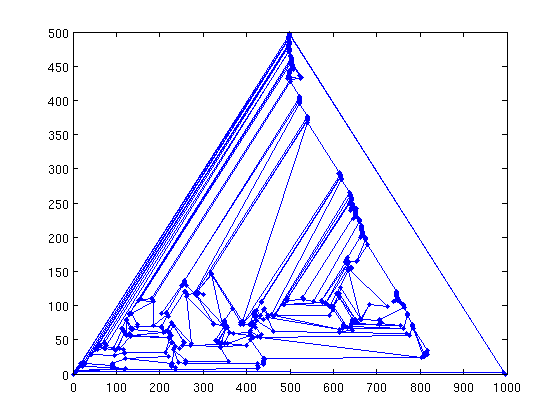 Well, that looks more helpful, but I don't see the planarity problem. Now, let's try contracting edges. What the following code does is to look for vertices of degree 2 (pieces of a line) and remove the intermediate vertex. In Matlab it isn't very efficent code, but this graph only has a few edges (~1000) at this point, so it'll be fast enough. fprintf('check for is: %i\n', full(sum(a&s))==0); % verify indep set. The maximum degree is 3, so the subgraph must be isomorphic to K_3,3. That is the problem with the graph, but why doesn't the display show it? Well, it does. 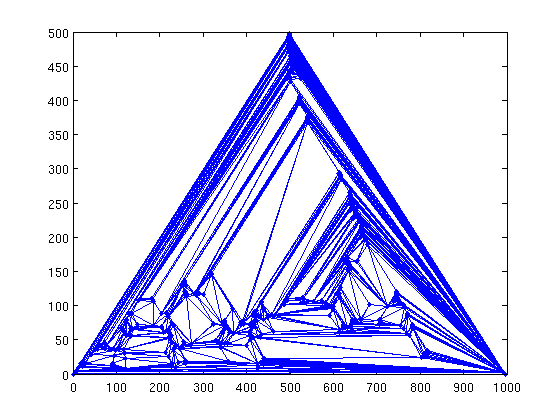 It looks like there is a vertex of degree 4 in the middle. Unfortunately, that is just 2 paths crossing. Zooming in further, there are actually two vertices there! That's the problem! Problem, automatically identify the following pairs of vertices as problematic for the planar embedding [2546,2547] [1971,1975] [1663,1666] Find another pair that prevents a planar embedding of the graph. 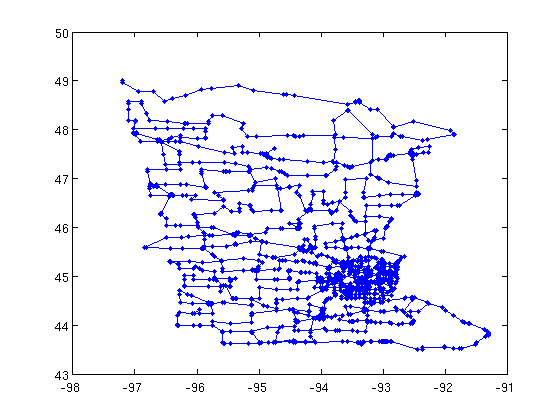 To investigate planar embeddings, let's start with the road network again. Good, we found a planar region! Well, that isn't quite as helpful, but now you know how to compute a straight line drawing. The straight line drawing is computed from a maximal planar graph. A maximal planar graph cannot have any additional edges and still be planar. 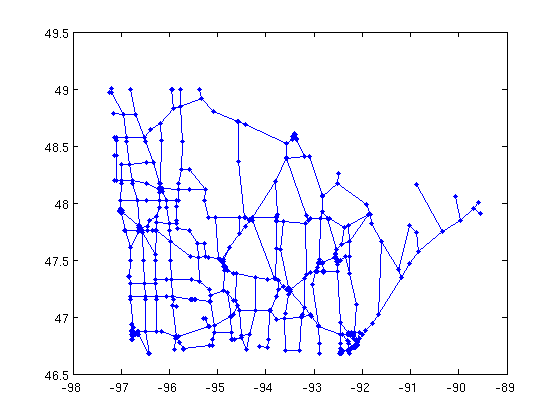 That's it for our brief tour of planar graph algorithms in MatlabBGL. 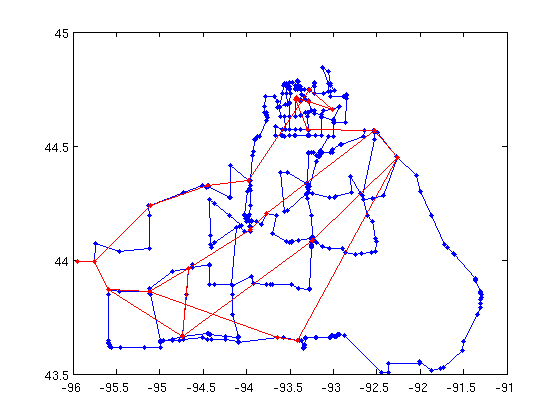 See the BGL documentation pages on planar graph algorithms for more information.